In the wake of the Supreme Court’s ruling upholding most of the 2010 health care law, the percentage of Americans expressing an unfavorable opinion of the court is at its highest point in more than 25 years. Currently, 51% view the court favorably while 37% have an unfavorable view. In April, shortly after the court heard oral arguments on the health care law, 52% viewed the court favorably, 29% unfavorably. In July 2010, more than twice as many had a favorable view than an unfavorable impression of the Supreme Court (58% vs. 25%). In the new poll, more Republicans view the court unfavorably (51%) than favorably (38%). That is a sharp reversal from April, when a majority of Republicans (56%) had a favorable view of the court and just 25% held an unfavorable opinion. Over the same period, the percentage of Democrats expressing a favorable opinion of the Supreme Court increased 12 points, from 52% to 64%. Similarly, views of the Supreme Court are more closely associated with opinions about the 2010 health care law than they were three months ago. Currently, nearly two-thirds (65%) of those who approve of the law have a favorable opinion of the court, compared with just 37% of those who disapprove of the law. In April, opinions about the court were about the same among those who approved and disapproved of the law (52% favorable and 55% favorable, respectively). In contrast to overall opinions of the Supreme Court, perceptions of the court’s ideology have shown little change. Currently, 41% say the court is middle of the road ideologically, while 24% view it as conservative and 23% say it is liberal. That is little changed from July 2010 (39% middle of the road, 23% conservative, 23% liberal). Republicans are more likely than Democrats to view the court’s ideology as liberal (36% vs. 12%). But the percentage of Republicans viewing the court as liberal is little changed from two years ago (34%). Democrats and independents’ views of the court’s ideology also have changed little. 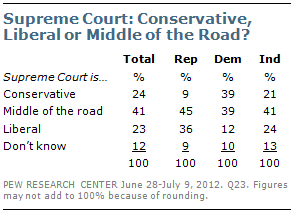 Currently, 39% of Democrats say the court is middle of the road, while the same percentage says it is conservative and 12% say it is liberal. Independents’ views mirror the general public’s, with a plurality (41%) saying it is middle of the road. 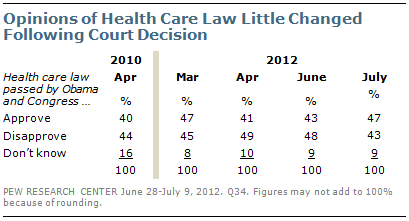 The court’s decision has had only a modest impact on the public’s views of the 2010 health care law. Currently, 47% approve of the law while 43% disapprove. In June, the balance of opinion was somewhat more negative than positive (43% approve, 48% disapprove). 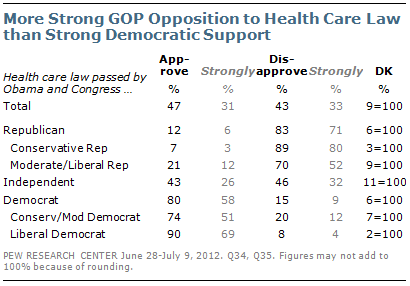 Currently, about as many strongly approve (31%) as strongly disapprove (33%) of the health care law. Last month, there was more strong disapproval than strong approval (35% vs. 26%). Nonetheless, more Republicans strongly oppose the law than Democrats strongly support it. About seven-in-ten Republicans (71%) say they strongly oppose the 2010 health care law, while 58% of Democrats strongly support it. While independents are divided over the law (46% disapprove vs. 36% disapprove), more independents strongly disapprove than approve (32% vs. 26%). 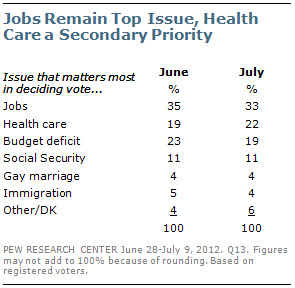 As was the case in June, jobs are the top issue for voters. Currently, 33% cite jobs as the issue that matters most in deciding their vote, little changed from last month (35%). The percentage citing health care as the top voting issue also is largely unchanged – 22% now, 19% then. About as many voters cite the budget deficit (19%) as their top voting issue as cite health care. Smaller percentages say gay marriage and immigration will matter most in their vote (4% each).